It turned out so yummy that it has become my family's favourite dish. Ginger-garlic paste ........... 2 tbsp. Garam masala ................... 1 tsp. Red chilli powder ............... 1/2 tsp. Turmeric powder .............. 1/4 tsp. 2. Grind the dal to a smooth paste adding 1 tbsp. ginger-garlic paste, one green chilli, garam masala powder, red chilli powder, salt (to taste)and a dash of water to grind. 3.Heat one tbsp. of oil in a pan and add the dal batter. Keep stirring until it becomes thick. (into the consistency of making balls).Let it cool a bit and roll small amounts of it into balls / golis.Wet your hands with water while rolling to get them smooth and round. 4.To prepare the masala, heat a tbsp. of oil in a pan and add the onion.Stir fry and add the tomato, the remaining ginger-garlic paste and green chilli.Sprinkle a pinch of turmeric and red chilli powder.Add a little water and saute for a minute. 5. Now gently place the dal golis in the masala mixture and simmer for a few minutes. Stir them carefully once or twice to coat all the masala.Garnish with coriander leaves and serve with rotis. Grind together 2 small onions, 1 tomato, 5-6 cloves of garlic, a small piece of ginger and 1 green chilli. In a pan heat oil and saute this masala until the colour changes. Stir in salt and the dry masala powders.Put the prepared moong dal golis and simmer adding a little water to cook for 8-10 minutes. Finally stir in a few table spoons of thick coconut milk. Give 2-3 boils and garnish with chopped coriander leaves. Yes Roshan..good to make some variations..hai na. This looks like a very novel method of making 'kofta' type balls, w/o deep frying.. Thanks for visiting my blog. This recipe looks delicious and new to me.Thanks for sharing. Thanks Anu...you got a nice blog too...I have to go through all your recipes.....will do it soon. Wow that is one protein packed dish..looks absolutely delicious! Wow this looks great,mom prepares pulusu with moongdal vada but this is very new to me and looks cool..Shall try it next week. Do try it out Smitha...we had it today and my hubby relished it. Healthy and yummy dish,looks awesome. Unique dish..healthy and absolutely delicious. Yes ...even I could not believe they will taste good without frying,until I ate the sabji. wow, amazing. I have to bookmark it and try it out. wow...very innovative,comforting and healthy recipe...excellent presentation with step by step pictures...will definitely try this. Ha ha .. I like that name. Shobhaji, fried moong ki goli ki subzi tau bahut baar khai hai par binna fry kiye itni tasty subzi kha ke mazza aa giya. BTW maine goli nahi banai par thaali ko grease karo yaa pani laga ke woh mixture jama do aur barfi ki tarah knife se kaat ke rakh lo aur proceed just like goli. Aur isi ka maine snack bhi banaya, just put 2tbs. oil and add rai, jeera, methi seeds, hing, red pepper flakes and add the pre-cut goli and on low heat stir fry then carefully and when heated through dish it out and serve with any chatney of your choice!! Enjoy and I like ur blog. Thank you so much for liking... aapki recipe bhi try karoongi zaroor. 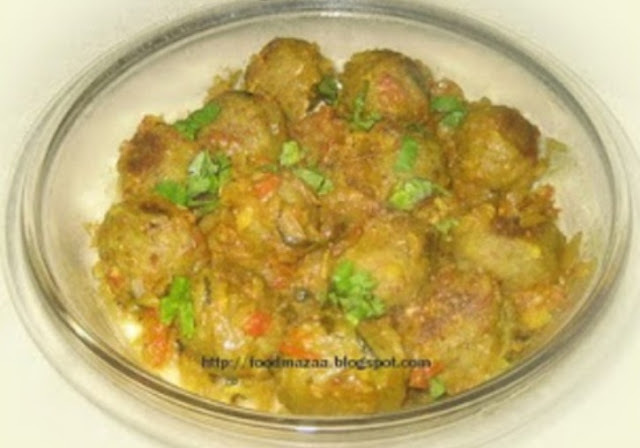 Its very new to me, interesting n innovative recipe..
its very new to me, must try this soon, bookmarked. thanks. 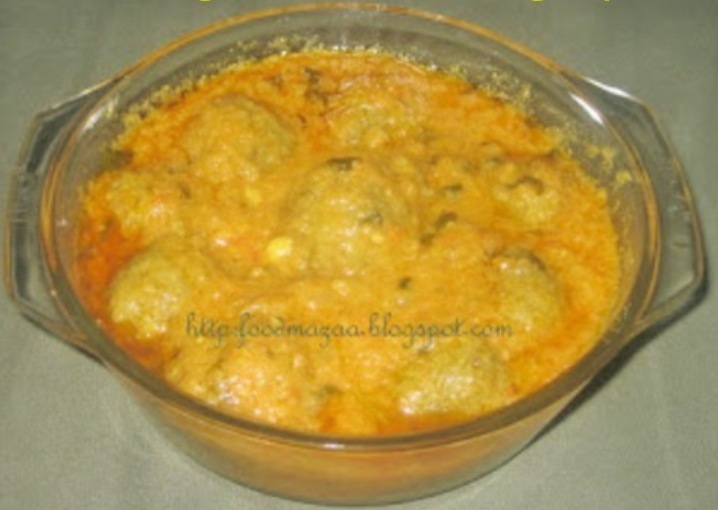 Loved this low fat ,no fry version of daal kofta's ..delicious! Completely a new dish for me. I will book mark to try soon.